Every time we see “Sponsored Post”, we would be like, “Just scroll it down,” don’t you? We skip most of the newsletters on our email. Ain’t got no time for that. These digital marketing campaigns are getting played out. To attract consumers, we need something more engaging, something more memorable. In the previous post, we have explained how virtual reality could be the next big thing in branding and marketing strategy. In this post, we will list down 14 best VR marketing examples that may inspire you. So, here you go, VR marketing examples that have ever done by brands around the world. Thomas Cook, a British global travel company, installed virtual reality headset, Samsung Gear VR, in 10 of its U.K. stores to give users, who came to the stores, 360-degree experiences of New York (views from the top of the Rockefeller Center), Singapore, Egypt (views from its historical sites), Greece, and other countries. Using this virtual reality marketing campaign, Thomas Cook said that over three months, the revenue for New York excursions was up by 190 percent, and flight and hotel bookings went up by £12,000 ($17,500) from people making a purchase after using virtual reality. 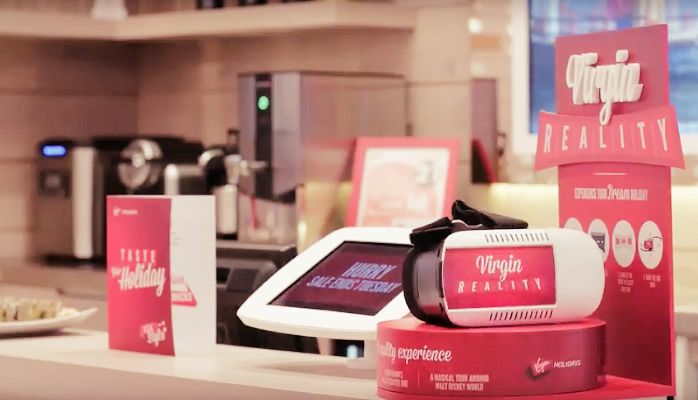 Virgin Holidays has already been using virtual reality in some of its stores for more than a year. They made a unique solution for the waiting customers to do a virtual tour of Virgin Holidays’ destinations while waiting. The experience allows them to ‘try before they travel’. The customers could venture to Riviera Maya in Mexico (Virgin Holidays’ key destination) and other selected destinations. Thus, the experience kept customers in the stores longer and generated a significant rise in sales of holidays to Riviera Maya. 3. Virtual Tour by Abu Dhabi Tourism Authority. If you want to travel a destination, it’s all about the images and videos. However, Abu Dhabi Tourism Authority wanted to take a new strategy that makes people taste the feel of Abu Dhabi, much more intimate than images and videos. Partnered with Visual Experience, they delivered virtual reality experience at the booth of its event. Using Oculus, the experience allowed people to virtually visit the landmark sites in Abu Dhabi. It then became one of the most highlighted booths at the event. We are living in a smartphone era where students are more engaged to apps than books. In line with Saudi Vision 2030 to build up renewable energy sector, it is strongly important to introduce this topic to young generations in the Kingdom of Saudi Arabia. So, partnering with Visual Experience, Mishkat (the Interactive Center for Atomic and Renewable Energy) is about to launch BeThere: Renewable Energy Edition in September 2017. It is a virtual reality book, which includes a Mishkat-branded virtual reality viewer and a virtual reality application which will bring students to visit Renewable Energy Park and to experience how it all works themselves. The goal of BeThere: Renewable Energy is to engage students in the topic of renewable energy through virtual reality, where they won’t feel like studying but experiencing. Visual Experience is currently opening a partnership to create a virtual reality book for any kind of organizations. To some people, distance is the main problem to visit KAUST Museum. Therefore, we partnered with KAUST Museum to launch a virtual reality merchandise called Vieseum. Viewseum includes a KAUST-branded virtual reality viewer and a virtual reality application that allows visitors to virtually explore KAUST Museum from home. Viewseum is shared as memorable giveaways to the visitors from KAUST Museum. The same strategy is used by Effat University, giving away a branded virtual reality to have a virtual tour of Effat University from home. The market share of Volvo in U.S. had declined for a decade. So, the brand needed to release its new SUV, the XC90, in a brand new way. First off, Volvo understands that people need to touch, feel, and experience a car before deciding to buy it. Volvo also understands that people nowadays own a smartphone. 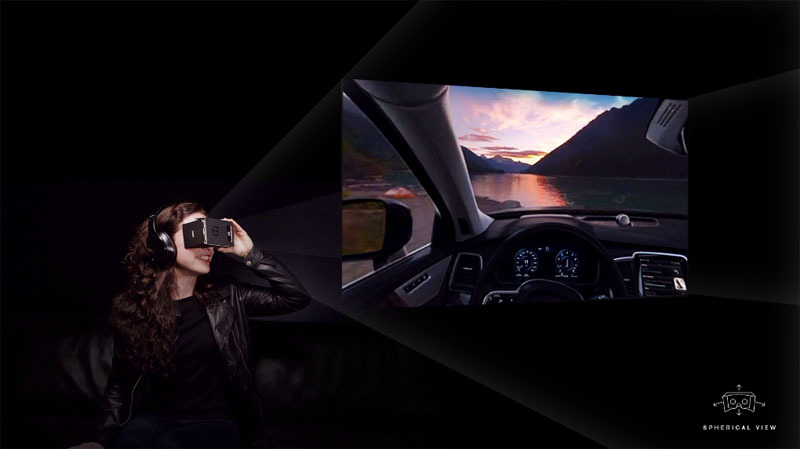 So, that’s it: Volvo created Volvo Reality, the world’s first virtual reality test drive available to anyone with a smartphone and Google Cardboard, an affordable virtual reality headset. This VR marketing example got over 238 million PR impressions, 159 million paid media impressions, 19 million social media impressions, nearly 4 million video views, 24 earned news stories, and a half-million web page views. Most importantly, the first edition of XC90s sold out in less than two days. If there is magic in advertising, then here it is. In the beginning of 2016, Partnered with 360i, Oreo launched a 360-degree video to promote its new Filled Cupcake Flavored cookies. It is an animated virtual world that took users through a wonderland full of milk rivers and chocolate canyons. Just watch the video, I bet you want an Oreo by now. The video has had over three million views and counting. If there is generosity in adverting, TOMs Shoes is doing it right. TOMs wanted the customers to know how a simple act of buying a pair of shoes is helping someone else around the world. So, using virtual reality technology, TOMs virtually brings its customers to Colombia, meeting the children that benefit directly from his purchase. But how do they do this? Well, the brand is giving away 100,000 Google Cardboard with Toms purchases and uploading the virtual reality experience on YouTube. According to Blake Mycoskie, the founder of TOMs, virtual reality is going to be a huge part of their communications strategy going forward. Read more about TOMs Shoes’ VR marketing examples. Let’s say, you want to do some home improvement all by yourself. However, you‘re not confident to do so, as you’ve got no skills. Moreover, you’re worried how the result would look bad if applied to your house. And, that’s why Lowe launched Holoroom How To in its 19 stores. Holoroom How To is a virtual reality training tools that will provide you a simple way to share and get the opinions of others, before moving forward with a project you’ll be living for years. With Holomroom How To, you can paint the wall, tile the bathroom, and anything you want for your home improvement. To see how a new room could look like, for example, you can select the plumbing, tiling, lighting, fixture placement and wall colors you would like, and then fit it into the actual room’s dimensions. While the training can be done using the Oculus Rift in stores, you can also view them at home with family and friends with Google Cardboard. 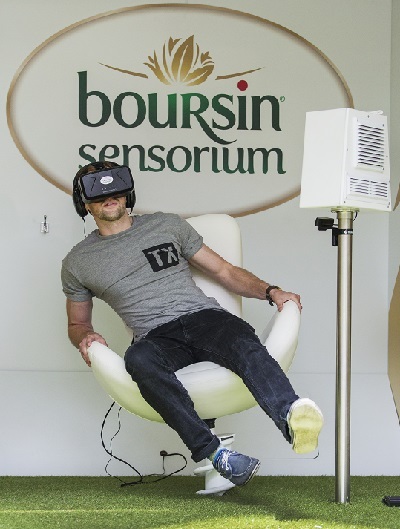 Soft cheese supplier Boursin created a virtual reality experience that takes you on a magical ride through a food lovers fridge, packed with the fresh ingredients included in Boursin® original recipes. They hired the marketing agency BecauseXM and Hammerheadvr to deliver the project. Boursin exhibited this in various malls and events around the United Kingdom. The New York Times was giving out a million Google Cardboard headsets to its print subscribers, as they launched a virtual reality application called NYT VR. With NYT VR, users can travel around the world and hear the story from another part of the world. From NYT VR, we have already traveled to Ukraine, Syria, and even Pluto. We won’t forget how The New York Times brought us to this experience, and that’s how they strengthen their brand. McDonald’s was doing it for fun. When virtual reality was getting the hype in 2014, McDonald’s enables its packaging boxes to be a virtual reality viewer. The viewer works enough to experience virtual reality from a smartphone. 13. Virtual Reality for Fifa World Cup by Coca Cola. Partnered with YDreams’ to celebrate last year’s Fifa World Cup, Coca-Cola was working on virtual reality technologies to immerse visitors in the “Casa Coca Cola”. Visitors were taken to a mock locker room in Brazil’s Maracana Stadium to put on VR headset. The experience took visitors from the locker room to the pitch during a 2014 World Cup game, where they played for the home team. 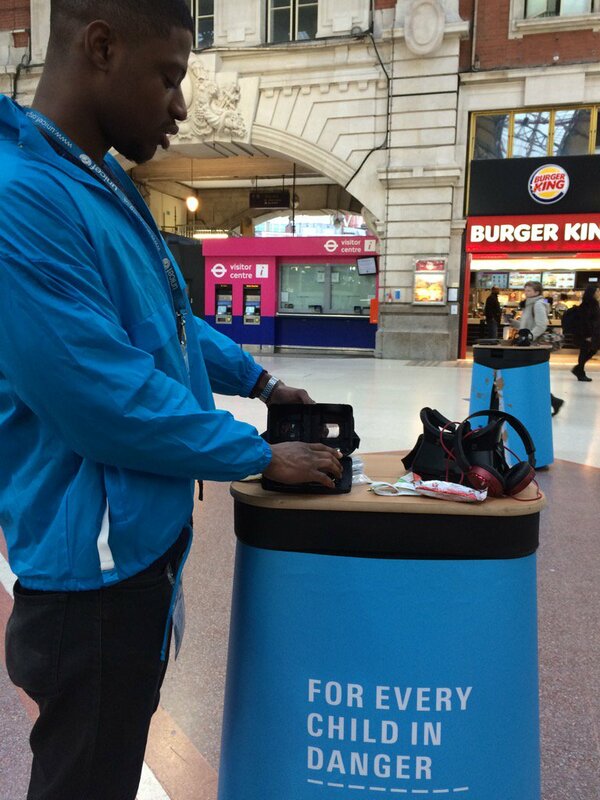 By doing so, the participants would recognize that the experience was “thanks to Coke”. UNICEF created an 8-minute 360-degree film called ‘Clouds over Sidra’ to draw attention to the Syrian refugee crisis: The film focuses on the life of a 12-year-old girl living in a refugee camp in the Jordanian desert. By giving viewers a more realistic ground level picture of their sufferings, UNICEF made people understand the real adversity that humanity was enduring. So, out of these VR marketing examples, which one makes you inspired the most? Share your opinion below!